You're probably wondering, "Why didn't I think of that?" Steyr Motors has invented an electrical generator that snuggles inside a diesel engine bell housing. 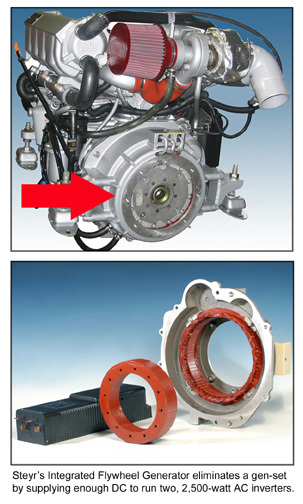 More particularly, it's a generator end bolted to the flywheel and splined to the transmission. So naturally it follows, the clutter of a dedicated genset is eliminated, freeing up space up for creature comforts like a reverse osmosis watermaker or a larger capacity refrigerator. Steyr's Integrated Flywheel Generator makes 300 amps worth of 12-Volt DC power, which is enough capacity to power two 2.5 kW AC-household current inverters. In the alternative it could also be wired to continuously charge a house bank of four 85 amp hour batteries. 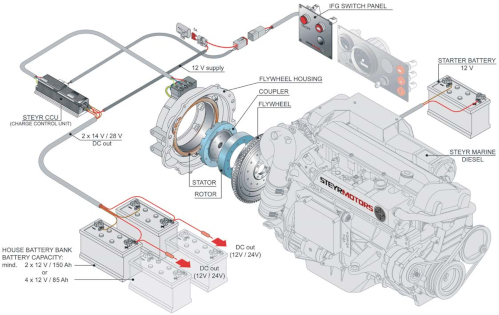 The brains of Steyr's Charge Control Unit monitors flywheel generator load and automatically makes adjustments. IFG is operated from, and its status is revealed, on a panel-mounted switch, installed anywhere inside the boat. Another big plus, the entire IFG system, including battery bank, are isolated from the main propulsion charging system and starting battery. To maintain IFG at its most efficient temperature and output, it's plumbed to the engine cooling system. Think cool running. Steyr's flywheel generator boasts robust, permanent magnets and features a three-phase, brush-less design. That means virtually zero maintenance. Because the system operates at over 80% efficiency, it generates lots of electricity at low rpm. Steyr's Integrated Flywheel Generator is available on its marine diesels from 85 hp through 250 hp.